General histories listed on the page for Books about Angus & Kincardineshire, in particular Warden, vol. 5, pp. 210-231. 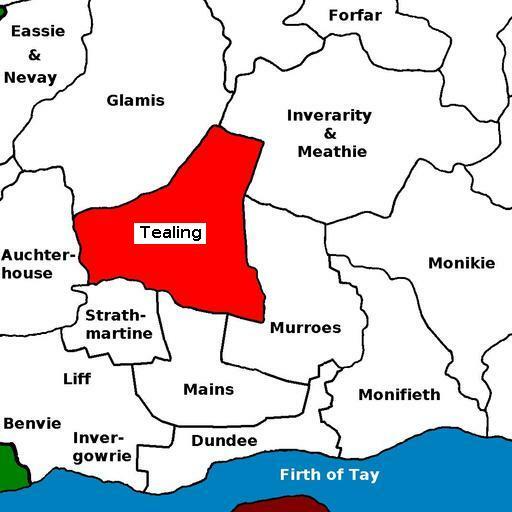 For the full range of maps of Tealing, see National Library's Maps. Geograph.org: Tealing - recent photographs of Tealing. National Grid ref. NO4037. Located at National Grid ref. NO403379 in Kirkton of Tealing. Built 1806. There is an article, with photographs, on Tealing Parish Church in A Corpus of Scottish Mediaeval Parish Churches. 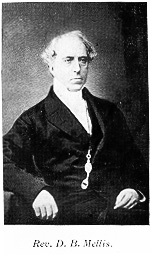 William Elder 1843-1890 b. 1804 Dundee; ord. min. of Orig. Secession Ch. Cupar FIF 25 Aug 1836; joined Ch. of S.; min. of St Mary's Cupar 1839; tr. & adm. 28 Sep 1843; d. 26 Aug 1890 unmar. * See, further, Presbyterian Church, Isle of Man and The First Century of Presbyterianism in Douglas, but note that Newhall is in Fetteresso KCD, not Perthshire as stated in the latter. Neil S. Elder 1883-? b. ca. 1852 Watten CAI; M.A. There is a monument to the Rev. David Barclay Mellis, his wife and son John in Greyfriars Kirkyard, Edinburgh. At NO404382 north of Kirkton of Tealing: Photographs & names. Tealing was in the Commissariot of Dunkeld [NRS CC7].